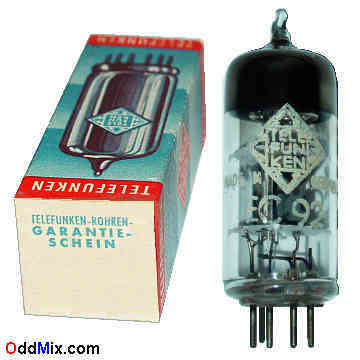 This is an original Telefunken EC92 High-Mu H.F. Triode electronic tube. Subtitutes are the 6AB4 and - except for the filament voltage the - PC92. This tube is useable as push-pull cathode-drive amplifier and frequency converter in VHF television and FM receivers. A High-Mu triode may be used for many other special purpose circuits like oscillators, multi-vibrators, blocking ocsillators and RF amplifiers for replacement, antique radio or television restoration projects, experimentation or to set up a private vacuum tube museum. One available!